"1 photograph; 20.8 x 24.2 cm. "1 photograph; 20.8 x 24.3 cm. 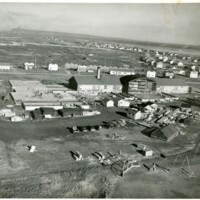 Several large buildings and parking lots with many houses in the background. 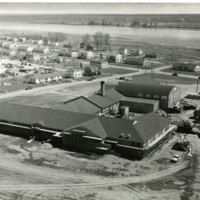 Text on the back of photo reads: ""Spalding Elementary School""." "1 photograph; 20.9 x 24.1 cm. "1 photograph; 20.8 x 24.1 cm. 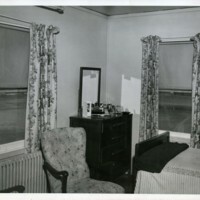 Furniture in room with a few other household objects. 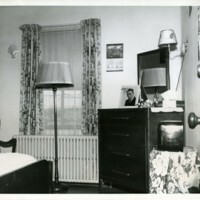 Text on the back of photo reads: ""A typical double room in a men's dormitory. Both single and double rooms are available at extremely moderate rental rates.""" "1 photograph; 20.7 x 24.2 cm. "1 photograph; 20.3 x 30.3 cm. 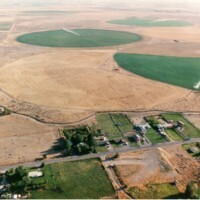 Several circular fields along with man houses beside roads." "1 photograph; 20.2 x 34.2 cm. Four people, one man, woman, and two children posing for a picture." "1 photograph; 6.6 x 9.2 cm. 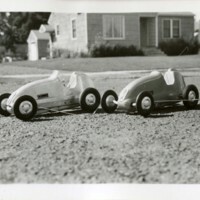 Two model cars on the ground with house in the background." "1 photograph; 4.3 x 6.3 cm. 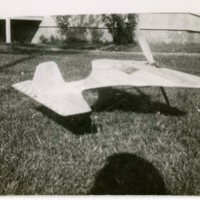 Model plane on the grass." "1 photograph; 6.3 x 9 cm. 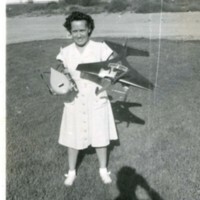 Woman is posing with model plane and model car, one in each hand." 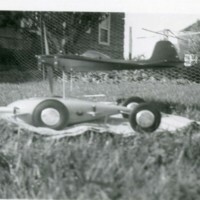 Model plane and car on cloth outside on ground." "1 photograph; 4.6 x 6.3 cm. 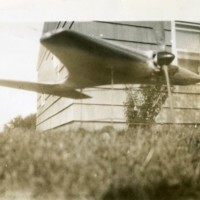 Model plane in the grass with a house behind it." 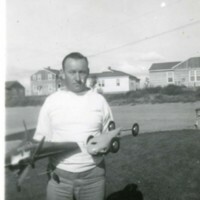 Man holding a model plane and car one in each hand with houses behind him." 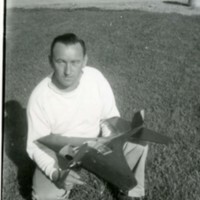 Man with model plane in hands with house in background." 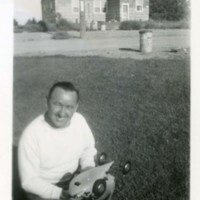 Man smiling with model car in hands with house in background." 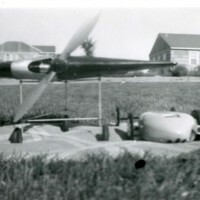 Small plane and car on cloth outside on ground." 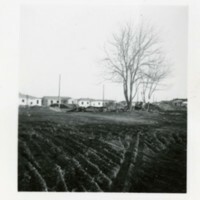 "1 photograph; 6.8 x 9.1 cm. 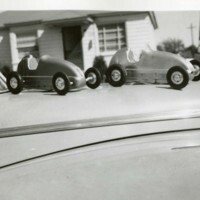 Two model cars are placed on the hood of an actual car outside of a house." "1 photograph; 8.3 x 11.6 cm. 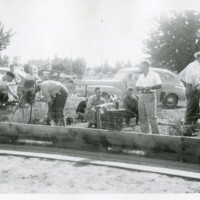 Several men in field, one of them looking at camera." "1 photograph; 6.9 x 10.9 cm. 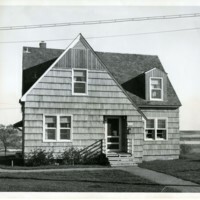 An alphabet house, specifically a F house, along with others that look very similar to it nearby. House has a white picket fence along with a small variety of plant life along side the edge of the house." 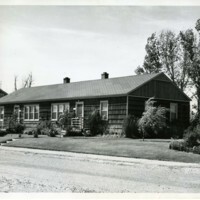 A smaller alphabet house, specifically a H house, with many trees and some plants in the front and on the side of the house. 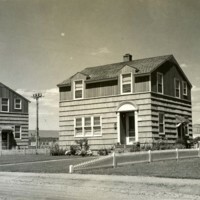 There are also houses nearby in the background." 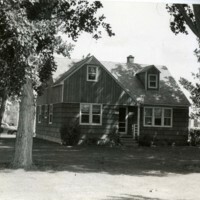 Alphabet house, specifically a D house, with trees surrounding it. The number 82 is on the house and there is a car behind it also." 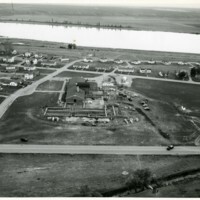 Above view of large building with many cars near by along with other buildings, cars, and in a distance, many houses." 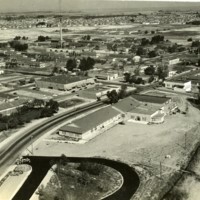 Above view showing several buildings and roads. Houses are also in the distant background." "1 photograph; 6.3 x 9.1 cm. 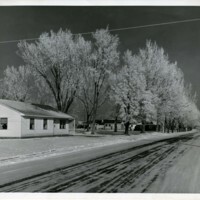 A couple bare trees along with several houses in the back. 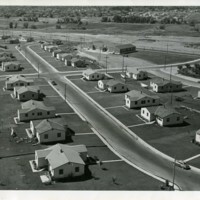 Text on back of image reads: ""Prefabs""." Small pools up front with several houses back further. Text on back of image reads: ""Possibly G-way near; Richland Baptist church""." "1 photograph; 6.3 x 6.5 cm. Cars parked on street outside building and next to houses." 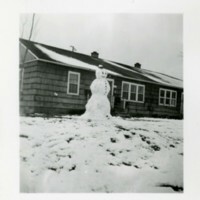 Snowman in front of an alphabet house." "1 photograph; 6.4 x 10.8 cm. 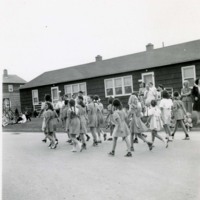 Girls walking through a parade in front of a house." "1 photograph; 12.7 x 17.7 cm. 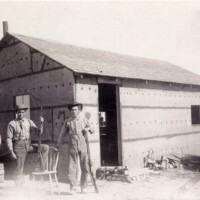 Three men with guns posing for a picture next to small roofed area." Construction on playground and also houses are in the background. Text on back of image reads: ""A.E.C. Hanford Engineer Works; Progress Photo No. 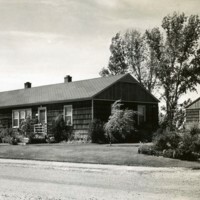 1; Date 9-17-47; Area Jefferson School; Code P""." "1 photograph; 20.6 x 25.4 cm. 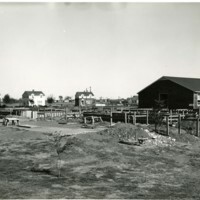 Construction with posts and also houses are in the background. Text on back of image reads: ""A.E.C. Hanford Engineer Works; Progress Photo No. 4; Data 9-22-47; Area Jefferson School; Code P""." 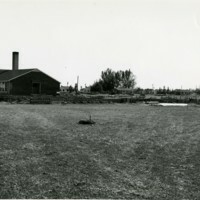 Construction with posts and also houses are in the background. Text on image reads: ""A.E.C. Hanford Engineer Works; Progress Photo No. 7; Date 10-5-47; Area Jefferson School; Code - P""." "1 photograph; 20.7 x 25.4 cm. Jefferson building with houses in background next to the river. Text on back of image reads: ""A.E.C. Hanford Engineer Works; Progress Photo No. 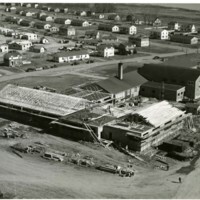 9; Date 10-21-47; Area Jefferson School; Code P""." Jefferson building under construction with houses in background. Text on back of image reads: ""A.E.C. Hanford Engineer Works; Progress Photo No. 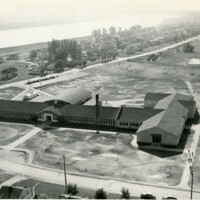 10; Date 11-5-47; Area Jefferson School; Code P""." Jefferson building under construction with houses in background. 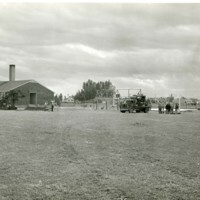 Text on back of image reads: ""Hanford Works; Photo No. 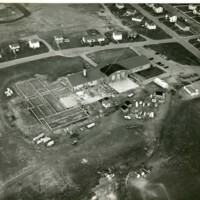 11; Area Jefferson School; Date 11-17-47; Code P""." Jefferson building under construction with houses in background. 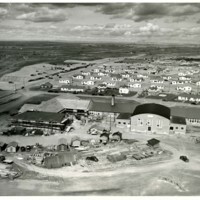 Text on back of image reads: ""Hanford Works; Photo No. 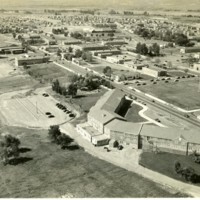 12; Area Jefferson School; Date 12-1-47; Code P""." 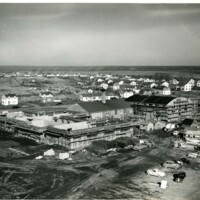 Jefferson building under construction with houses in background. 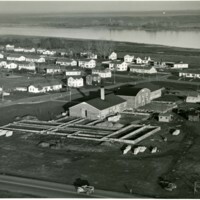 Text on back of image reads: ""Hanford Works; Photo No. 13; Area Jefferson School; Date 1-9-48; Code P""." "1 photograph; 20.7 x 25.3 cm. Jefferson building under construction with houses in background. 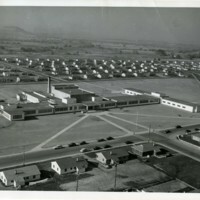 Text on back of image reads: ""Hanford Works; Photo No. 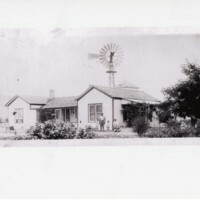 14; Area Jefferson School; Date 2-11-48; Code P"""
"1 photograph; 20.8 x 25.4 cm. 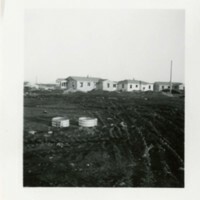 Jefferson building under construction with houses in background. 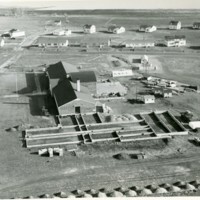 Text on back of image reads: ""Hanford Works; Photo No. 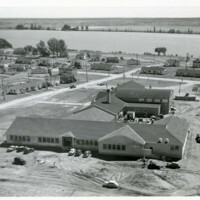 15; Area Jefferson School; Date 3-10-48; Code P""." "1 photograph; 20.1 x 25.7 cm. 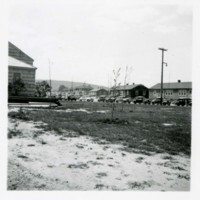 Jefferson building with houses and cars in the background. 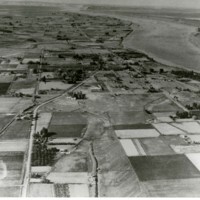 Text on back of image reads: ""Hanford Works; Photo No. 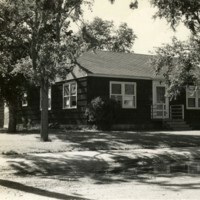 16; Area Jefferson School; Date 4-6-48; Code P""." Jefferson building with houses in background next to the river. 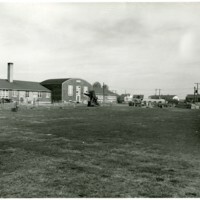 Text on back of image reads: ""Hanford Works; Photo No. 17; Area Jefferson School; Date 5-1-18""." "1 photograph; 20.2 x 25.8 cm. Jefferson building with houses in background next to the river. 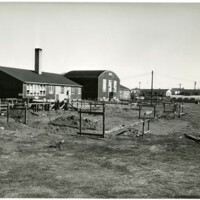 Text on back of image reads: ""Hanford Works Photo No. 20; Area Jefferson School; Date 7-7-48""." Jefferson building with houses in background next to the river. 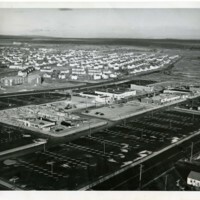 Text on back of image reads: ""Hanford Works; Photo No. 21; Area Jefferson; Date 10-19-48""."